We conducted a surreptitious, prospective, cohort study to explore how often physicians nod off during scientific meetings and to examine risk factors for nodding off. After counting the number of heads falling forward during 2 days of lectures, we calculated the incidence density curves for nodding-off episodes per lecture (NOELs) and assessed risk factors using logistic regression analysis. In this article we report our eye-opening results and suggest ways speakers can try to avoid losing their audience. Despite their known inefficiency, lectures (“a means of transferring notes from the pages of the speaker to the pages of the audience, without going through the mind of either”) continue to predominate as a means of helping physicians learn their trade. At a recent 2-day lecture series, we noticed that many of the attendees around us were nodding off, including one of our coauthors (C.J.P.). 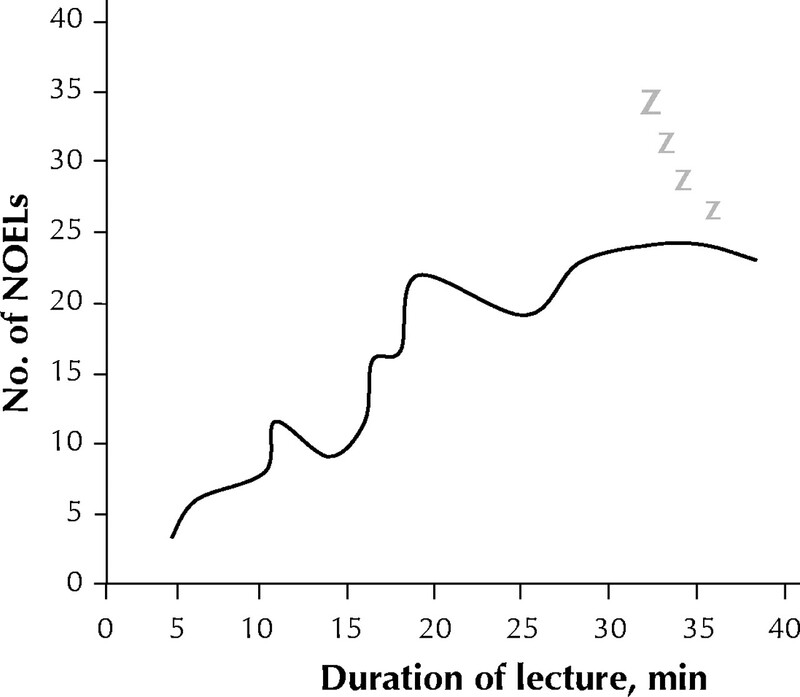 After awakening him, we decided to study the boredom itself by measuring how often physicians nodded off during the lectures and assessing risk factors for this behaviour. Since we were sitting together at the back of the room, we counted the number of heads falling forward as a sign of nodding off. We chose this method because counting is scientific. We carefully recorded data on what we thought seemed like reasonable risk factors; anything we were unsure of we made up. In as much as a single episode of nodding off indicates submaximal attention, we calculated incidence density curves. To be fair to the speakers (after all, we are Canadians), we counted only 1 nodding-off episode per listener-colleague per lecture. For the logistic regression analysis we dichotomized nodding-off events as occurring at a frequency above the median or, at or below, the median or less. Because this was an exploratory study, we also administered a short questionnaire (Appendix 1) to colleagues who had nodded off. About 120 people attended the 2-day lecture series. We had to adjust our analysis because many had left by the end of the second day. The quality of the lectures varied from entertaining and informative, to monotonous and repetitive, to rushed, to Felliniesque. The incidence density curve ranged from 3 nod-off episodes per lecture (NOELs) to 24 NOELs per 100 attendees (median 16 NOELs per 100) (Fig. 1). Risk factors for NOELs are presented in Table 1. Fig. 1: Special incidence density curve, showing number of nodding-off events per lecture (NOELs) per 100 attendees over length of time of presentation. Interviews with colleagues who nodded off revealed that they were comforted to know they were not alone. Most had no enthusiasm to attend boring lectures but were inclined to go if influenced by payment, CME credits, guilt or obsessiveness. Being internists, all but 1 were relieved to discover that their falling asleep was not their fault but that of the speakers. We observed that clinically important proportions of physicians nodded off during the lectures, that there appeared to be a dose–response effect and that speaker characteristics were the strongest risk factors. Our study had important limitations. Because we sat at the back of the room, we could not see everyone's faces. Thus, people who can sleep without head movement would have been missed. However, since we were counting physicians who were “nodding off” and not “sleeping,” we were pretty much covered there. Misclassification bias was another possibility, especially since the rapid flashing of slides could have induced absence seizures that may have been mistaken for nodding-off events. Another limitation was one of undercounting, especially during lectures by the more boring speakers. Such speakers can induce inattention (and its common correlate, fantasy) to the extent that it becomes impossible to concentrate on the task of counting nodding heads. However, as far as we can tell, at least 2 of us were attentive at any given time, so we doubt that undercounting was a factor. Perhaps this is fantasy, though. Overcounting may have occurred if some of the NOELs were actually vigorous noddings in agreement (NIAs). However, experienced observers such as ourselves can readily distinguish between NOELs and NIAs by a variety of associated factors, including timing, amplitude, frequency, and presence of snoring, drooling and gasping. Narcolepsy, however, must remain in the differential diagnosis of NOELs. We were interested to observe that some intrinsically boring talks (those with obscure topics, few data, absent analyses) had unexpectedly low NOEL rates. We attributed this to the bizarreness of the presentation. Factors such as wandering off to inspect the screen, dropping the microphone or just raving — although disconcerting to the audience — helped to keep the physicians awake, as did side bets among attendees on when the speaker's prefatory comments would end and the actual topic of the lecture addressed. We were surprised to see the relation between tweed and NOELs. Further analysis shows that it is tweed, not plaid, that is implicated. Tweed is often worn by fops, but many otherwise admirable men wear tweed from time to time without apparent adverse effects. Chronic tweed wearing, however, might indicate a boring phenotype, or it might be causal: tweed may harbour little insect-like creatures whose dander could cause asthma and chronic hypoxemia, with subsequent cerebral dysfunction. Without appropriate clinicopathological correlation it is impossible to say. Thus, we have resolved, in the interests of science, to sacrifice a few boring speakers and study their brains, pending ethical approval. 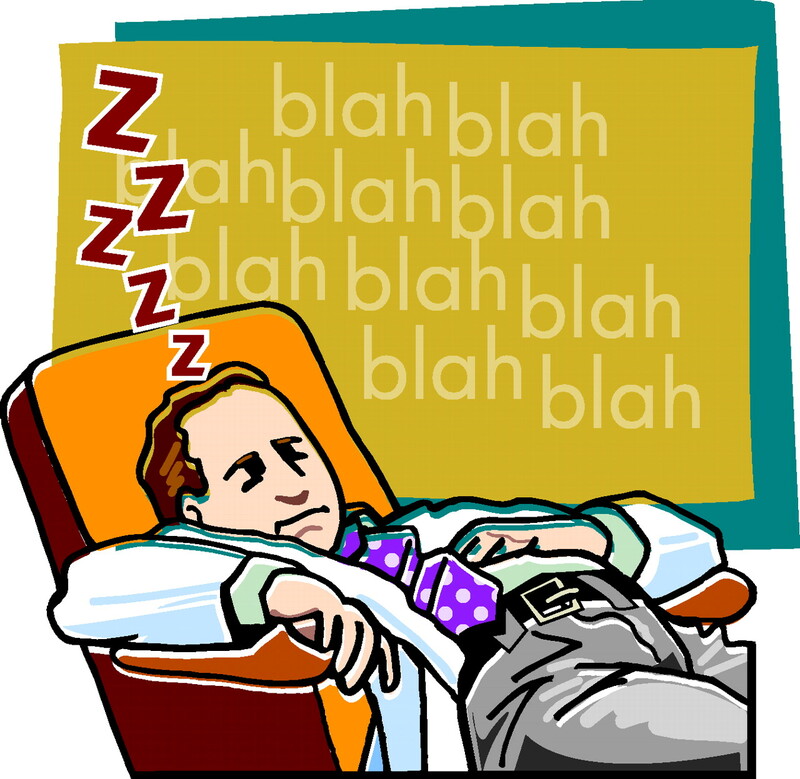 Nodding off at presentations is common and may pose a risk to the health of patients. Studies are required to assess the effectiveness of interventions (e.g., lessons in public speaking, wardrobe makeovers, drama classes) in preventing nodding off during lectures.